This post covers two 15 week training cycles of a 22 year old, female, short sprint (50m) swimmer leading up to a weekend of competition. The athlete has been training seriously for four years. Competition comprises four or five events (three 50m sprints and one/two 100m sprint). During the whole period heart rate variability (HRV) was taken daily immediately after getting up in the morning. The key interest in this type of cycle is that it starts with speed endurance then moves to limited sets of basic endurance in every session with the focus on high intensity power and short sprint work. In the cycle shown from August 2015 to late October we carefully responded to HRV readings, either reducing or omitting training sessions when indicated. This worked well for the speed endurance period of around six weeks with gradually rising HRV. However, by the end of the power and speed sessions, although we had been reacting to daily changes in HRV we began to get the early indications of overtraining. We then spent the remainder of the cycle compensating with more days of recovery but never quite got back to a good recovery and didn’t get a good run-in to the competition, missing out on some of the speed work and with a disrupted pre-taper and taper. The athlete performed well emotionally and in terms of effort in competition (managing five events over three days) but speeds were down and the only PB achieved was in a 100m event. When we examined the HRV chart for that cycle one thing we noticed was that although daily changes looked OK when we looked at training mini-cycles as groups of readings it was clear that we had a series of falling trends. In the chart you can see that we had a series of drops and recoveries on a daily basis but over 3-4 weeks the HRV trend fell consistently until we were forced into a mini-taper in order to restart at high intensity. Contrast this with the speed endurance mini-cycle where the trend is rising. This suggested to us that we should be looking not only at the daily recovery response (as indicated by ithlete Pro’s train/not train response) but at how the trend was developing. Looking at all of the content online regarding HRV we found almost all studies and blogs refers to HRV being used by endurance or endurance dominant athletes. There is very little content on its use for power athletes and still less for out-and-out sprinters. Our experience (over 4 years of ithlete use) is that for sprint training we only get a cumulative rise in HRV when in a speed endurance phase. When we are focussing training on fast endurance work we can see a consistent rise in HRV. However, for pure speed we need to work on power and short and ultra-short sprint sets (25m and 12.5m). During these periods you don’t get the cumulative HRV gain and just following the daily indications we think tends to lead to overtraining. We wondered then whether we might get a better improvement if we carefully monitored the trend, particularly during power and speed mini-cycles, so that immediately a falling trend began to develop we would take an extra day or so for recovery. In effect we are trying to prevent the falling trend developing by continuing recovery until the trend is rising. We tried this for the last cycle which finished on 6th March. This seemed to have a positive effect with the athlete being able to train better. Unfortunately, a necessary trip from Moscow to the UK resulted in a cold virus and the last three weeks of the cycle were disrupted. Competition performance was good considering she had not even been in the water for three weeks. She managed four events (three 50m and one 10m) with a PB in one of the 50m events. Looking at the chart for the most recent period you can see there were no sustained falling trends. We think that we are onto something with monitoring the trend particularly during high intensity/low endurance mini-cycles. The plan is to repeat this cycle of training now (without the travelling disruption) and see whether if we can complete the cycle like this we might get a greater improvement. It seems clear that with this individual we only get rising HRV when focussing on speed endurance (which is not surprising) and during high intensity power and speed sessions the trend may be as significant as the day-to-day readings. You can also see that the flights to and from Moscow to the UK along with the virus had a calamitous impact on HRV only climbing again a few days before competition. – Sprint training produces a different HRV response to endurance training. – There seems to be significantly less data available for sprint athletes and coaches using HRV at present. 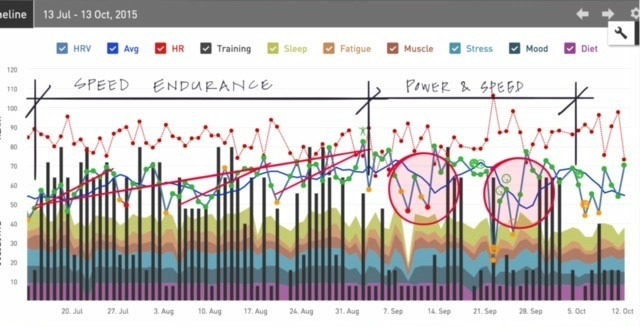 – During speed and power training it is critical to look not just at the day-to-day train/don’t train indications but also to observe the HRV trend. A falling trend even with daily green readings tends to lead to over-training. – We need to continue to monitor and analyse the use of HRV readings in order to get the most out of this as a training tool. Georgina is a 22 year old sprint swimmer who began training seriously aged 18. Prior to that she had been involved in athletics multi-events and ski-racing (slalom and grand slalom). She is also an accomplished flautist and chorister. Born in London she grew up in Bunbury, Cheshire and lived there until 2014 when she moved to Moscow. She is particularly interested in challenging the myth of age around sport, the idea that unless you are super successful as a junior you can’t make it as a senior. She views her current programme partly as an experiment to demonstrate that athletes can start later and still reach a high level in their sport. She began using Ithlete at the very start of her committed training programme in 2012 which is based around a ‘recovery’ model rather than the traditional swimmers mileage model. Martin was born on the Carpenters Estate in Stratford East London growing up in a block of flats overlooking what is now the Queen Elizabeth II (Olympic Park). He has been involved in amateur sport most of his 61 years to varying degrees. As a junior he represented Essex at Water Polo, Basketball and Swimming (breaststroke sprint). He was persuaded by Georgina to take on the role of swimming coach in 2012. He has spent most of his working life as a consulting civil, structural and infrastructure engineer involved in the the regeneration of post-industrial towns and cities. He is currently based in Moscow working for a Russian property development company setting up their technical department.